Edge Signs started 9 years ago when Les Edge moved to Banbury from Central London, whilst modernising his own business of traditional signmaking which he had run for over 20 years. Although he still does much traditional work, including personalising suitcases for Louis Vuitton, he has brought his son Tim into the business, which enables him to carry out his other great passion, working with the Contemporary Arts Society teaching artists around the world. Based from their modern premises in Banbury, Tim recognises the importance of moving the business forward, especially with clientele who ‘want their signs tomorrow’ where much of the work involves everyday signage, often involving a lot of substrate panels. He concluded that an in house cutting facility was required. Like most signmakers, his space was limited, so he opted for one of Sagetech’s Zapkut brand ZM machines with its compact moving column design. This results in them being able to cut both horizontally along the length of the sheet, or vertically across the sheet’s width without the sheet needing to move. “We are really pleased we got it. 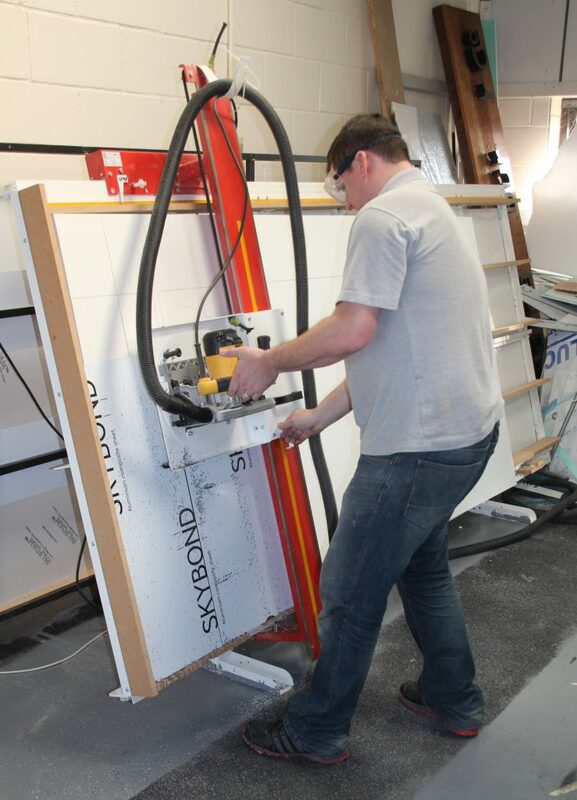 It’s a fantastic machine and we use it for cutting everything from Foamex, Perspex, Dibond and MDF. It does everything we require, and we would be lost without it. The cut on Dibond is particularly good, and the machine as a whole is nice and sturdy”. The Zapkut ZM range of machines start as low as £2,495 for an 8’ x 4’ (2500 x 1250 mm) capacity unit. This is just one of the now four ranges of machines offered by British manufacturer Sagetech, who specialise in vertical panel saws for the smaller business. The Zapkut brand is for lighter duties, and in addition to the ZM range they also offer a unique ZK portable unit in two sizes, which when not in use can be folded up compactly and stored conveniently, say hanging on the wall. The Koolkut brand is for those needing a heavier duty machine, where the KF and KK Koolkut units offer capacities up to 3.1 x 2.1M, thus these are capable of handling the big 3 x 2M sheets. Sagetech provides a very comprehensive range of sizes and models, enabling their customers to select the most compact, space-saving solution appropriate to their business, unlike the “one size fits all” approach of some manufacturers. So for a signmaker only working with smaller sheets, Sagetech’s models are particularly compact and beneficial in saving space.